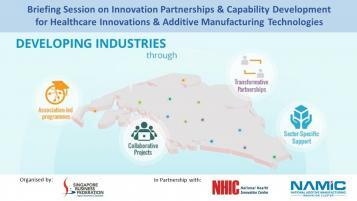 SBF is partnering with National Health Innovation Centre (NHIC) and National Additive Manufacturing Innovation Cluster (NAMIC) to conduct a complimentary partners’ briefing on Innovation Programmes, to help companies develop sector capabilities through Healthcare Innovations and Additive Manufacturing (AM) Technologies. In addition, the speakers will also share with you on the funding streams for innovation to support projects and tackle unmet sector needs. Please contact David at 6827 0851 or email david.pooi@sbf.org.sg for registration.